ZIMO has recently released a new decoder format that is worth a dedicated page to collect my notes on specifications and applications. The NEW format is dubbed the ZIMO MX660 Micro DCC Sound Decoder - Universal Board-style Hardwire with Large Solder Pads. This is a new format in the decoder market and concept you might find appealing! I shopped the concept of this format around for several years but never found an audience. I met Mr. Peter Ziegler, owner and founder of ZIMO ELEKTRONIK, GmbH, for the first time at the NMRA National Convention in Indianapolis, IN in 2016. We discussed many things DCC and I pitched my concept for a N Scale sound decoder based on my years of experience as an engineer, model railroader, and DCC professional. Mr. Ziegler looked at the idea and replied, "So you want a MX649 laid out end to end". He got it. The concept of the MX660 was born. Regarding the last characteristic, I want to take a moment to explain my rationale for this because I think it is the crux of the matter and defining characteristic of this new decoder format. It is my opinion that there will never be a manufacturer willing to produce a drop-in board style decoder to fit every model of N Scale locomotive chassis. It's just not practical. I look at my inventory of N Scale drop-ins and shudder when I think of how much it would cost to carry inventory of equivalent sound decoder. I wouldn't even bother to calculate the expense incurred by a manufacturer. It is also my opinion that if I have a decoder that is thin and flat on one side, I can mill the top of any frame flat (down to the top of the motor cradle in most cases) and make a perfect place for a decoder. I can manage power pick-up using OEM equipment or SBS4DCC 0-80 Ring Terminals, I can get two wires from the motor easy enough, and I can manage lighting with SMD LEDS in a hundred different ways. Finally, it is my opinion that nearly every N Scale diesel frame has a shelf over the rear truck or space in the cab to fit a SBS4DCC Sugar Cube Speaker. If the decoder is about the same length as the motor and flywheels I don't encroach on that space over the rear truck the way a long thin decoder or short fat decoder does. Now I have ample space for a SBS4DCC "Sugar Cube" Speaker 9x16mm 8 ohm .7 watt w/ Double Deep Sound Chamber even if I have to mill the rear shelf down a bit too. ZIMO sound decoder offers an innovative concept for sound adjustment and optimization, which makes these procedures particularly simple for the user. The user can produce usable sound even without a computer or detailed configuration variable settings. ZIMO sound decoders also offer all of the world class functions of our non-sound decoders: silent drive selectable between 20 or 40 kHz, adjustable BEMF, special settings for coreless motors, optional kph or mph speed control, constant stopping distance, HLU, ABC, advanced uncoupling functions, smart stopping (prevents stops on dirty track sections), updatable firmware, and RailCom. The MX660 is the universal board-style hardwire "micro model" for N scale sound in the ZIMO decoder range. The MX660 is essentially the MX649 laid out flat with absolutely nothing on one side of the circuit board to allow easy mounting against any surface. This revolutionary new format is perfectly suited for N scale narrow hood diesels and other applications where height and width are limiting factors. The board-style format is only 9.6mm wide and 2.5mm thick and is blank on one side. It features a robust 0.8A motor circuit, 1W amp, 6 function outputs with unique constant current design, and connections for external energy storage, especially important for uninterrupted sound. 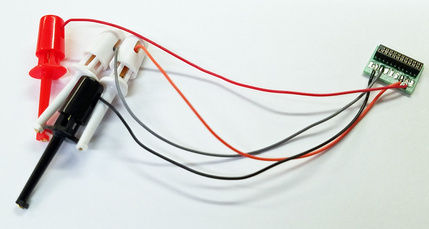 The large solder pads make it easy to terminate hardwired connections from the track pickup, motor, and lighting functions. As with all ZIMO sound decoders, the MX660 features an on-board energy storage capacitor and direct connections for additional off-board energy storage capacitors for the sound processor to minimize interruptions in playback caused by poor power pickup. Best of all, the function outputs utilize a revolutionary design that eliminates the need for external resistors making it perfect for use with typical 3.2Vf LED's. The on-board capacitor and output design eliminate the need for additional components that consume valuable space. The MX660 is the perfect micro sound decoder for narrow hood diesels because it is the thinnest sound decoder on the market today, measuring just 2.5mm tall. The footprint is so compact, it fits easily into almost any Athearn, Atlas, Fox Valley, Intermountain, Kato or other narrow hood N scale diesel. The MX660 will be perfect for compact HO scale models as well. Conforms to applicable NMRA DCC Standards and Recommended Practices. Address range from 1 ... 10239, consist range 1 ... 127; Functions controlled by main or consist address. 14, 28 or 128 External Speed Steps, 256 or 1024 Internal Speed Step resolution for incredibly smooth motor control. 3-point adjustable speed curve (CVs #2, 5, 6) or fully programmable 28-step speed table (CV #67 - 94). Top speed (CV #5) can be used even when the speed table is used (CV #67 - 94), which means that all entered table values will be reduced automatically (i.e. to 80% if CV #5 holds a value of 200 instead of 252). Switching Mode button function - Selectively switches to low speed and/or reduces or even removes programmed momentum. Supports Operations Mode (Program On Main) and Service Mode (Program Track) CV Programming. Special programming mode called "Pseudo Programming" for Digitrax, Lokmouse-2 and other systems with only 2-digit display (up to 99). Hard reset with CV #8 = 8; Optional hard reset to Alternate CV Set or sound project with CV #8 = 0. Automatically recognizes and switches between the MOTOROLA and DCC protocols. Operates with standard DC analog power packs, PWM power packs, and DC power supply. Motor regulation and momentum are also available in analog operation. AC analog operation with Marklin transformers. ZIMO decoders recognize the power surge that initiates a direction change. Reliable high voltage protection and short circuit protection for motor and function outputs. Thermal protection (100 - 120 C), shuts decoder down and notifies user with flashing headlights. Models available for use with track voltage up to 35 V (MX644, MX699). The Self-Optimization feature of the decoder automatically tunes the motor control parameters of the decoder to the locomotive. Designed to startup at extremely low threshold voltage. Adjustable compensation for gear backlash during direction changes to eliminate startup jolt. Mph or km/h speed control. Each speed step (1 - 128) is interpreted as 0.5 mph, 1 mph or 2 mph (for high speed trains). All locomotives on the layout are adjusted by means of a semi-automatic calibration section (i.e. 160 scale-yards = 72.83 on the layout). In operation, the speed is kept as exact as possible by continuously recalculating and readjusting it. Special circuitry to prevent interference from capacitors, choke coils, which are often found on motors. In some cases removal of these components may still be beneficial (See Decoder Manual). Uninterrupted operation (no stalling, stopping and new startup) during continuity interruptions of up to 1 second. All current models of ZIMO decoders have Common (+) and Ground (-) pads available for adding external capacitors. Many ZIMO decoders have special circuitry for adding external capacitors (SPEIKOMP, SPEIGOMP) which minimizes programming interference. Uninterrupted operation on dead track sections. The decoder firmware prevents the loco from stopping when track power is lost, even while the loco is coming to a scheduled stop. This ensures that the loco can start up again even after the capacitors dissipated the stored electricity. Note: Requires external energy storage module MXSPEIK or MXSPEIG, other similar products or self-made modules connected to the decoder. 4-15 Normal function outputs and logic-level outputs, depending on decoder type. 2-4 Low voltage 5.0V servo outputs, depending on decoder type. SUSI interface for the connection of other external modules, most often sound modules. ZIMO Free Function Mapping procedure (CV #61=98) enables mapping of any output to any function key, directional or non-directional, which is not possible with NMRA function mapping. ZIMO Swiss Function Mapping (CV #61=...) for special cases such as direction dependent taillights and cab light in Swiss engines. Variable cycle times and minimum dim values. Special CVs for automatic uncoupling (aka The ZIMO Coupler Waltz). After pressing the function key defined for this action, the loco backs up a few millimeters to unload the couplers then actuates the uncoupler and moves forward away from the train. The distance the loco backs-up and moves forward as well as the loco speed step is definable with CVs. Note: On some decoders, the same function outputs can be used as either logic-level, servo or SUSI outputs. The common function output, also called a "Logic Level" output or "unamplified" output, refers to the voltage level at the terminal (0V for "off", 5V for "on"). The funtion output has an internal protection resistor equal to 10K Ohms resulting in 0.5 mA maximum available output current. If set, the common function outputs are used for servo control. Note: Logic-level outputs can power one LED or any other load by using an external amplifier (i.e. M4000Z). "Logic Level" outputs can be amplified by adding the ZIMO M4000Z Logic Level Function Amplifier or similar devices. CAUTION: "Logic Level" outputs are NOT active in the default configuration of the decoder because they use the same ports as the SUSI interface (clock and data) as well as the servo-control lines. ZIMO sound decoders are equipped with 6 independent sound channels, 1 to 3W sinus audio output at 11 kHz or 22 kHz depending on sound sample and 32 Mbit memory. ZIMO sound decoders use digital audio amplifiers supplied with 5V from a regulated power supply. The sound produced from this solution is not influenced by fluctuations in the power supply and is fully available on analog DC systems of over 5V. A sound-memory of 32 Mb corresponds to a playing time of 180 sec in the higher quality (22 kHz sample rate) and 360 sec in the lower quality (11 kHz). ZIMO sound projects typically use high quality sound samples of 22 kHz. 8 ohm speakers can be used with any ZIMO sound decoder which can be ordered from your ZIMO dealer. 4 ohms speakers or 8 ohm speaker arrays can be connected to the MX644 and MX645 models which have audio power up to 3 Watts. Virtual cam sensor for sound synchronization of steam engines lacking a real cam sensor. A function output is programmed to send 2 or 4 signals per wheel revolution, which causes the sound module to playback a chuff sound with every signal received. This output is connected to the same input on the sound module that normally connects to a real cam sensor. Most sound decoders have inputs for mechanical sound synchronization using cams, reed switches or hall-effect sensors. Acceleration and load dependent sounds can be automatically adjusted by a test drive to set the load sensitivity parameters, and many other features (See the ZIMO Sound Database and User Manuals). Recommendation: Two ZIMO "Sugar Cube" speakers with sound chamber (Part Numbers LS10X15 and LS8X12) produce high volume from a very small footprint. Note: During selection of the speakers, bigger is always better. It is very important to use a speaker enclosure, baffle or an airtight locomotive housing with a sounding board and openings in the housing, etc. for professional installation. Click on the links below to download copies of the MX660 Connection Diagram and ZIMO Small Decoder Manual. 6 sound channels, all playable at once! * Additional Design Information provided in the Function Output Design Section below. So this first question encountered is how to program a decoder like this. The simplest solution I have used for years with similar type decoders is to make a harness with test clips that plugs in easily to the MXTAPS or MXTAPV. The function outputs on the MX660 are designed specifically for driving LEDs directly. Regardless of the track voltage and the type of LED used, the function outputs provides constant current of 5mA. Dimming can be accomplished by programming the decoder's appropriate CVs. Note however that since the functions outputs can only supply 5mA, they cannot be used directly to power devices requiring more than 5mA of current (like 12V Grain of Wheat incandescent light bulbs, smoke generators, or automatic uncoupling devices. Here is the internal circuit which explain why there are no resistors at the outputs and why external resistor are not required. 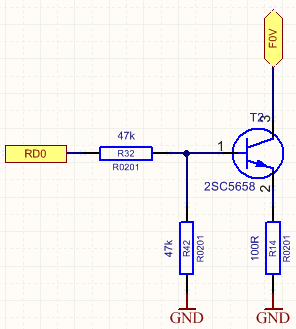 The voltage at the 100R resistor is about 500mV so the current is about 5mA. The power loss at the transistor for 22V rail voltage is: 22V - 2V (Led) = 20V * 0,005A = 100mW (Transistor allows 150mW) so a typical 3.2fV LED will not be damaged. The current sources can be built for the same price as a simple output with a 1K ohm resistor. The advantage is they always have the same brightness, independent of the rail voltage, and external resistors are not required when using LED's. Also a capacitor will have a better effect, because the current source will compensate the falling voltage of the capacitor while it discharges. If you want to connect more than one LED to an output, connect the LED's in series not parallel, so the current for every single LED will still be 5mA. The voltage of one white LED is about 3V so you can connect up to 3 LED's in series and it will still work with 12V rail voltage. If you use analog operation, you can connect them in parallel (so they will work from 4V rail voltage) but they will be very dim and this only works with absolute identical LED's. A white LED used in parallel with a red LED will definitely not work. Fits easily in the well of an InterMountain F-unit. Looks like a pretty easy fit with room for a speaker in the cab! Looks like a pretty easy fit with room for a speaker on the rear shelf. Might a speaker in the cab so plan on cutting this frame for best fit. Decoder is a pretty easy fit but plan on cutting frame to make room for a speaker. A big thanks to John Colombo for sharing this video of his installation in a Kato NW2.